There are three main types of cartilage in the body, hyaline, fibro, and elastic. Hyaline (or articular) cartilage surrounds the outer surface of the bones at the joint sites. Its function is to provide a smooth surface between the bones and also to act as a shock absorber for the heavy loads which joints are subject to. It is made up of substances called collagen, proteoglycans and water. These allow the cartilage to withstand both tensile and compressive loads. Cartilage is injured in one of two ways. An acute traumatic episode, such as a twisting or heavy impact injury of the knee can cause cartilage damage. Alternatively, repetitive micro-trauma and excessive loading of one joint or one part of the joint in particular can cause cartilage damage. The severity of a cartilage injury depends on the depth of the lesion. Grades vary from 1 to 4 with 1 being the least severe. Typically a grade one injury will be softening and perhaps fissuring (cracks) in the cartilage but the underlying bone is not exposed. In a grade 4 injury, the lesion extends to the bone and there is often significant bone bruising. In order to diagnose a cartilage problem a sports physician or physiotherapist would take a detailed subjective history first followed by a thorough clinical examination of the joint involved. Pain is usually well located to the site which is damaged. This may be intermittent, constant or associated with a specific type of movement. Generally the pain is made worse by weight bearing and impact activities such as running or a daily activity such as walking up stairs. Swelling, locking and/or giving way may be present. 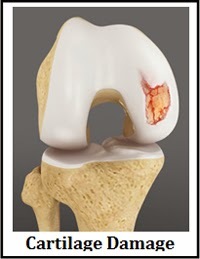 The locking is often due to a loose fragment of cartilage being wedged into the joint space. Giving way may or may not be associated with pain. Tenderness over the site of injury is often present and can help differentiate between other conditions. There may be pain on the extremes of range of movement, such as full flexion, or when the patient is asked to perform a squat. Muscle wasting of the quadriceps is common, often due to swelling or a lack of use. In order to rule out other possible causes of knee pain, and also to confirm clinical findings, the physiotherapist or sports physician may request a scan. MRI scans are the best form of scan as they will show both the extent of the cartilage damage and also the involvement of the underlying bone surfaces. Although the scan is useful in determining the location of lesion and ruling out other pathologies, until an arthroscopy is performed, the extent of the damage is not accurately known. Some cartilage tears can be managed successfully with a conservative treatment regime of restoring strength, balance and flexibility. However, if surgery is needed, the following types of surgery are available. This is the least invasive form of surgery, and involves removing any unstable parts of cartilage and also cleaning out the joint with a special solution. This is done either as a procedure in itself, or it can be done in preparation for a more extensive type of surgery. The technique used here is to drill or peck small holes into the underlying bone in the area where the cartilage defect is found. This procedure works by inducing degree of trauma to the bone which initiates a healing process and subsequently the cartilage defect is replaced by fibrocartilage. This is a very common procedure and has good results however the new cartilage lacks some of the biomechanical properties of hyaline cartilage, especially its ability to withstand load. This is a two-stage operation. The first stage is to remove and harvest some cartilage cells from a non-weightbearing aspect of the knee. The cells are then placed in a culture to expand using specific enzymes. This takes approximately 3-4 weeks. The second operation involves implanting the cells underneath a patch which has been harvested from the tibia (shin one) to cover the original cartilage defect. The patch is held in place by glue made up of fibrin. This seem to be the choice of treatment for larger defects and italso seem to provide a more hyaline type cartilage which is more durable. Cartilage damage is common both in the young and older age group. Although sometimes difficult to treat, new procedures and advanced surgical options are allowing the patient to have a greater choice in the type of intervention they have. Hopefully as research develops, newer and even more successful procedures will become available. If you have any queries relating to any of the above, please feel free to contact one of the Sports Physicians or physiotherapists here at Pure Sports Medicine for further advice.